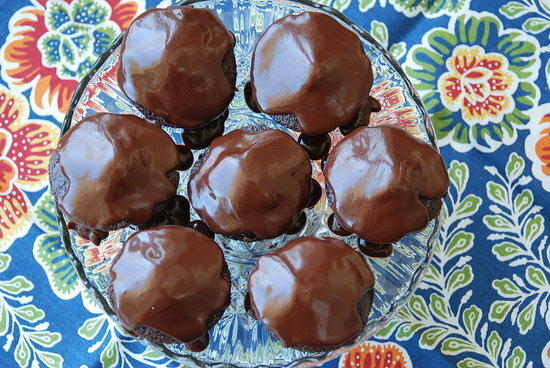 Let’s Celebrate with Killer Chocolate Cupcakes! What do you bake a 17-year old with perfectly clear skin for her birthday? Chocolate cake with killer chocolate icing, of course. Or cupcakes, in this case, because they’re so damn cute (and because you can easily send the leftovers far, far away, like to your husband’s office). Yes, my stepdaughter Sasha is 17, an unbelievable number. Nathan is about to be 14, John’s about to be 50, and I’ve got one foot in the grave myself. Good Lord. Yeah, that’s a seriously talented group of people to be associated with and I am over-the-moon excited and honored, sheesh. There will be five posts each week, one from each of us, mine on Tuesdays about…cooking at home. Check us out! And oh, the cake! This is a classic recipe, moist and easy, straight out of my Grandma Meyer’s Bethany Reformed Church cookbook from Clara City, Minnesota. Yes ma’am it is! 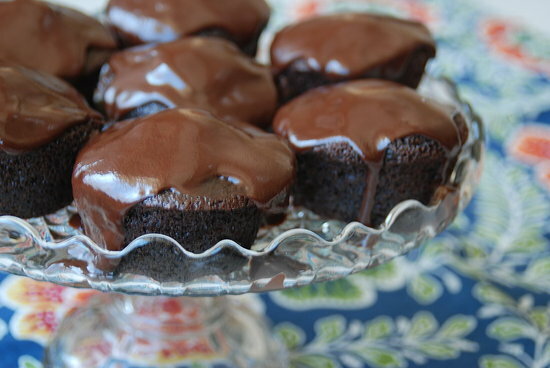 The icing is my killer chocolate sauce recipe, posted several times before, just a little chocolate and butter and cream. Mmmm hmmm. This makes two, full 9-inch cakes, or 24 cupcakes. I’ve halved the recipe successfully. You could bake the full recipe in a bundt or 9×13 pan (adjust baking time accordingly). Preheat oven to 350 degrees F. Grease and flour two 9-inch cake pans. In the bowl of a mixer, stir together the dry ingredients. In a small bowl, whisk together the eggs, milk, oil, and vanilla. With the mixer on low, add the liquid ingredients to the dry ingredients until just combined – scrape down the bowl. Turn the mixer to medium speed and beat for 2 minutes. Turn the mixer to its lowest speed and slowly add the boiling water. Turn off the mixer and stir by hand until the batter is just combined; it will be quite thin. Pour batter into prepared pans and bake for 30-35 minutes or until toothpick inserted in the center comes out clean. Cool cakes in their pans for 10 minutes, then invert onto racks and cool completely. Frost with your favorite icing. Good on everything! 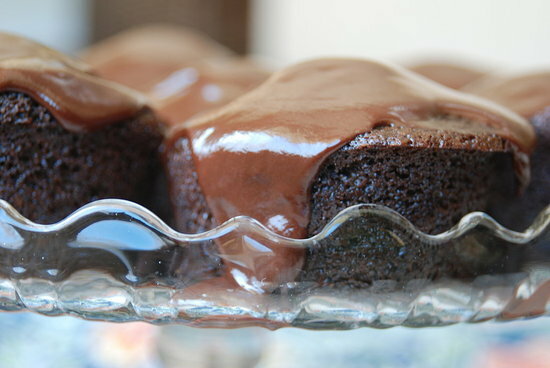 Especially as a poured icing for chocolate (or any) cake, or warm over ice cream or cream puffs. Stirred into hot milk to taste, it makes incredible cocoa. Combine all but vanilla in a medium saucepan over medium-low heat. Bring to a simmer, stirring several times, cook for 5 minutes, stirring several times. Remove from heat, carefully stir in vanilla. Cool to just-warm before pouring over cake or serving over ice cream or cream puffs. Can be cooled completely and reheated later. Keeps well for up to one week in the refrigerator.